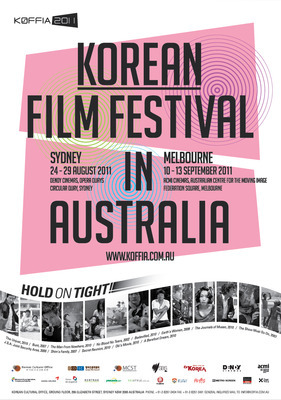 The Korean Film Festival in Australia is back in 2011 and this year they are showcasing a pretty impressive film program. Celebrating its second year, this film festival will be held in both Sydney (August 24th to 29th) and Melbourne (September 10th to 13th) and in addition to the film screenings, there are a host of special events lined-up, including Q and A events, industry forums and cultural performances. The film program is composed of both feature length films, as well as short films (titles are yet to be announced). Highlights of the forthcoming film program include the opening ceremony feature film The Unjust (2010), a critically acclaimed and commercially successful crime thriller from South Korean film director Ryu Seung-wan, whose previous directorial credits include the enjoyable action/comedy Arahan (2004) and the acclaimed action/drama The City of Violence (2006). The Unjust stars Jeong-min Hwang, Seung-beom Ryu and Hae-jin Yu. Another acclaimed festival feature film is A Barefoot Dream (2010), a popular drama directed by Tae-gyun Kim, who previously directed Crossing (2008). The film stars Gabriel Da Costa, Junior Da Costa and Zefancy Diaz. Bedevilled (2010), an award winning crime/thriller directed by Chul-soo Jang is also screening. This acclaimed feature stars Yeong-hie Seo, Seong-won Ji and Min-ho Hwang. The feature film is a festival favourite, having screened at the 63rd Cannes Film Festival, 5th London Korean Film Festival and 10th New York Asian Film Festival. Other feature films in the festival program include The Show Must Go On (2007), written and directed by Han Jae-Rim, The Secret Reunion (2010) directed by Jang Hun, The Man From Nowhere (2010), directed by Lee Jeong-Beom, No Blood No Tears (2002), directed by Ryoo Seung-Wan and another cult classic Joint Security Area (2000), directed by Park Chan-Wook. View the 2011 Korean Film Festival in Australia film program at the Korean Film Festival in Australia website. The free special events accompanying the exciting film program include Q and A events and industry forums with a diverse range of International and Australian special guests such as Ryoo Seung-wan (Director), Kang Hye-jung (Producer), Mathieu Ravier (The Festivalists, Jurassic Lounge), Richard Gray (DVD Bits, The Reel Bits), Dr. Leonid Petrov (Korean Studies Lecturer, University of Sydney), Dr. Jane Park (Gender and Cultural Studies, University of Sydney), Dr. Adrian Martin (English, Communications and Performance Studies, Monash Uni), Christian Were (Brand Manager, Eastern Eye, Madman Entertainment) and Al Cossar (Programmer, MIFF Melbourne International Film Festival). You can access the event schedule for Sydney and Melbourne at the Korean Film Festival in Australia website. Cultural performances include a Taekwondo (Korean martial art) demonstration, Korean Traditional Dance performance and a performance by actress/singer Hany Lee. You can view the cultural performance schedule here. The venue for the film screenings and special events in Sydney is Dendy Cinemas, Opera Quays and in Melbourne it is ACMI Cinemas, Australian Centre for the Moving Image. You can find further information on both of the venues here. Please note tickets go on sale for the Sydney leg of the Korean Film Festival in Australia on Friday, August 5th. Visit Dendy Opera Quays (02 9247 3800) to purchase tickets or visit the Dendy website. Tickets for the Melbourne event will be available soon. Keep up to date with all the forthcoming news and events during the Korean Film Festival in Australia by visiting the official website, Facebook profile, Twitter and Youtube Channel.